Blood on Satan’s Claw is a British Horror movie starring Patrick Wymark and Linda Hayden. The story is set in 17th century England and begins with a farm hand named Ralph Gower ploughing a field and unearthing a strange-looking skull that bears some fur and has one very functional-looking eye. Ralph is so unnerved by his find that he rushes to the farmhouse to inform a travelling Judge who is the guest of farm owner, Isobel Banham. The judge listens to Ralph, but he is not inclined to believe his story and it does not help matters when Ralph describes his find as the skull of a “fiend”. Isobel manages to coax the judge into action, but when he gets to the field the skull is gone and this only makes the judge more inclined to believe Ralph has wasted his time. While the judge is out, Isobel’s nephew, Peter, arrives at the farm. He has brought a young lady with him and announces, “I want you to meet Miss Rosalind Barton. She and I are to be married tomorrow”. Rosalind is certainly a comely wench and it is easy to see the attraction, but Isobel is not at all pleased by this turn of events and is not happy at the idea of Peter’s intended staying under her roof. In the end, she condescends to allow Rosalind to sleep in the attic, where the poor girl is driven out of her mind by something that emerges from beneath the floorboards. The following morning Rosalind is carted off to the madhouse and Peter is shocked to see that one of her hands has turned into a very large and unsavoury-looking claw. Distraught by his loss, Peter decides to sleep in the attic, but he wakes up in the middle of the night and discovers that his right hand has turned into a hairy claw and it is busy trying to throttle him. Peter does the only thing he can do, he reaches for his knife and hacks the thing off. On hearing the commotion, the Judge rushes to Peter’s bedside, sees what has happened, and calls for the doctor, who is probably the first person who has any idea what is going on. The doctor has an old book with him. One page describes a creature that resembles the one Ralph found buried in the field. The judge is loathe to believe that witchcraft has returned to the village, but on studying the book he becomes intrigued and takes the book with him when he leaves for London the following morning. Before he departs, the judge assures Ralph he will not forget them and will return when the time is right. If the evil is to be destroyed it must be allowed to grow first. Not long after this, local schoolgirl Angel Blake also makes a discovery in the field and begins behaving strangely. Soon many of her classmates are following her example, while others die horrible deaths and it is clear that an evil influence has been exerted over the children. The local preacher, Reverend Fallowfield, is also the schoolteacher and he becomes concerned when he arrives at school to find half his class is absent, while the rest show “insolent ungodliness”. “Where is Angel Blake?” he demands only to be told that she is teaching the other children some “new games”. Angel Blake is the focal point of the evil that has come to the village and when the sight of her naked body is not enough to turn Fallowfield’s head and get him to join her, she becomes angry and tells the local Squire that Fallowfield has assaulted her. The squire believes Angel’s lie and the Reverend is taken away to be questioned. Too many children are dying though, and when Ralph finds the body of his young sweetheart in the woods he tells the Squire that Angel Blake is responsible. Fallowfield is released immediately and Peter Edmonton rides off to get the judge, who warns Peter that they are dealing with something worse than witchcraft. He’s ready to return to the village, but warns he will use “undreamed of measures”. Blood on Satan’s Claw was made back in the 1970s so the special effects are limited. It is also a little slower paced than most modern horror movies. 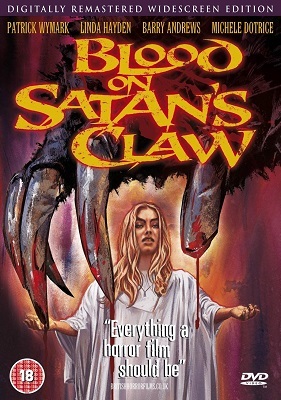 This may annoy some viewers, but in my opinion, Blood on Satan’s Claw still knocks the spots off a lot of modern horrors. The producers have managed to create an atmosphere of brooding evil that is apparent throughout the movie and makes it strangely unsettling to watch, but nevertheless very enjoyable. The entire cast of the movie are excellent and the choice of backing music is first-rate and adds a good deal to the inherent creepiness of the movie. Blood on Satan’s Claw is one of my favourite horror movies. It always has been, it always will be, and I had to wait far too long for it to come out on DVD, but that is okay. Some things are worth waiting for and streaming options have since become available as well.